FPF instructor Carmen Acevedo Butcher inspires her first-year students to thrive on the bigger Berkeley stage. Remember that one high school teacher who believed in you, who lit the fire that pushed you to pursue your dreams through a college education? 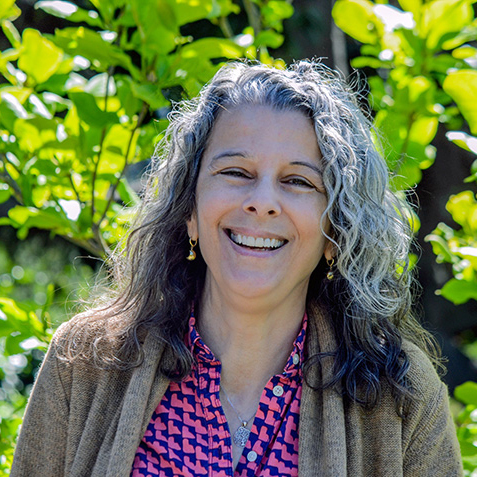 Carmen Acevedo Butcher is that teacher in the form of a professor in our Fall Program for Freshmen, teaching College Writing, among other courses. She teaches the basics of good writing so that each student is equipped to write at Berkeley's demanding level. Writing is hard work, and for the talented and smart students who come into her introductory courses, it can be a shock to learn that the expectations are now much higher than in high school. As she tells it, "Almost to a student, it's a real mental adjustment that writing is something that you go back through and revise. Often, a student comes to me, and says, 'I have revised this so many times.' And it's true. And I just say, 'One more time—at least.'" But here's where her empathetic nature peeks out—by sharing some of her own struggles. "I remember in my first college class, I got a D-minus on my first essay—and that was after making all As in high school. A D-minus. Not a D. A D-minus. I remember calling my mother from a payphone telling her that I wasn't cut out for college." Carmen makes it a habit to bring in that dreaded D-minus paper, both to show that she understands the students' struggles and to make the larger point that—after many, many revisions—she ended up getting an A-minus on that same assignment. That's one of the moments that Carmen loves: When the student gets it, when they realize that writing is a cognitive process that they can control. "The first few weeks are tough because you want them to do well,” she says. “And it never happens overnight. Then they start gaining traction and it gets to be really exciting." Carmen’s students tell her all the time how valuable her class is, how the ability to frame a coherent and compelling argument pays off in other courses. When she hears these success stories, Carmen nods her head in agreement: "What's the most essential thing in college? Right?" And here she breaks into a smile. "It's that moment that you can tell that they trust you. And then you think, 'We can do anything!'" The "we" is telling. For Carmen, teaching and learning is a team effort, and effective teaching requires her to look for different ways to reach her students. Sometimes getting students to listen means sitting back and letting her students talk. Carmen also employs self-assessment surveys in classes to judge how well the students are understanding the material. After one such survey, Carmen realized that the overwhelming majority of her students were frustrated by library research. So she set up library tours, organized a library scavenger hunt, led an in-class live-research session, and even arranged for Berkeley librarian Cody Hennesy to lead an in-library research workshop. All to help alleviate fears or unease about how to do research at the library. But what finally clicked with her students was when their peers shared their own successes—and knew that they, too, could navigate the library with ease. Student-to-student support and interaction is one of the benefits of the FPF experience. The small-college feel encourages such community, and that feeling of belonging is one of the features that Carmen most appreciates about teaching here. She gets to know her students, and that knowledge helps Carmen fine-tune her lesson plans so that she can reach each student and his/her own goals, needs and personalities. And that community extends beyond teacher and student. When asked what is the best part of the FPF experience, Carmen instantly responds, "The advisors! I cannot say enough good things about the FPF advisors. You can write that in gold ink. It's all of them. They are there for the students." You might save some of that gilded ink in praise of Carmen. Her care for her students sparkles in every sentence. Currently, Acevedo Butcher and her students are researching and discussing ways that Internet memes are affecting and possibly changing English language usage. BBC Radio is doing a series on this topic, so they sent over a crew to interview Acevedo Butcher and several of her first-year students. After the crew finished the interviews, they told her how poised and prepared her students were. At that thought, Acevedo Butcher smiled broadly. "Seeing students shine—that's part of a perfect day."